KOPEL Gibuma made history on June 9 becoming the very first Torres Strait Islander to be ordained to the transitional Diaconate in the Catholic Church. 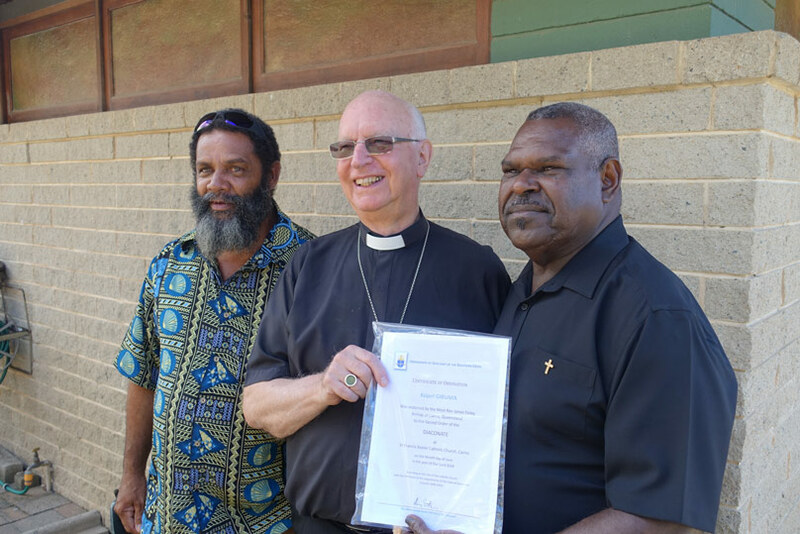 Deacon Gibuma of Queensland, was ordained by Bishop James Foley in St Francis Xavier’s Catholic Church, West Cairns. In observance of Torres Strait Island tradition, Rev. Gibuma was brought to the door of the church by fellow Islanders, accompanied by singing, guitars and the sound of traditional drummers. He was handed over by them to Msgr Harry Entwistle, Ordinary of the Ordinariate and Bishop Foley of Cairns who ordained him on behalf of the Ordinariate. The service was an impressive blend of Catholic sacramental worship, devout piety which were enhanced by Torres Strait traditional customs. It was appropriate that the Gospel was read by the Rev Ralph Madigan who is the first permanent deacon of Aboriginal descent to be ordained in the Diocese of Cairns. Following the service, Deacon Gibuma and the worshippers were greeted by traditional singing and dancing offered by Torres Strait islander singers and musicians. Deacon Kopel will assist Fr Gordon Barnier, the parish priest of St Clare Cairns with Holy Cross Dauan.